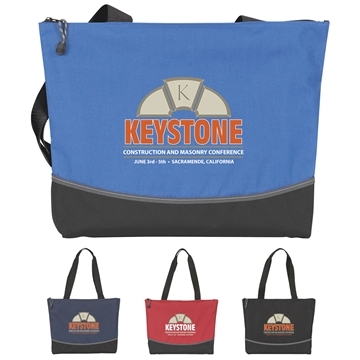 This is your everyday tote perfect for trade shows with the large zipped main compartment and the shoulder-length handles. Shoulder-length handles with sewn grips. Alicia was also extremely helpful in getting the order met and coming up with solutions to our timing problems. These totes are wonderful. You get what you pay for. Nice quality and printing. these are gorgeous and elegant, perfect for our company. I love the colors! No other vendor could beat your prices! Excellent printing!